Carpeted car mats are a long time favorite of both auto manufacturers and consumers. They are cushy, absorb some liquid, hold dust/dirt and dress up your vehicle. They may also closely match the color and texture scheme of your cars interior or starkly contrast your cars interior to set a “mood” or make a statement. Custom fit carpeted car mats may cover the floor pan (the area on the floor where you put your feet) better than your original mats while Universal fit mats won’t fit as well but will save you dollars. Carpeted car floor mats are made in layers. 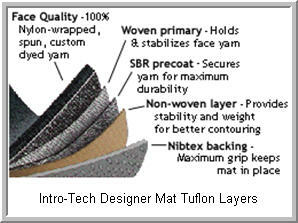 High density nylon yarns are twisted together, heat set and woven into little tufts of carpet. The more tufts of carpet per square yard the heavier and more plush the carpet. Typical carpet weights range from the economical Avery’s 18 oz. Luxury Sport mat to Lloyd Mats luxurious 48 oz. Luxe mat . The carpet may then be bonded to a polypropylene backing material which in turn is bonded to heavy latex for added stiffness. 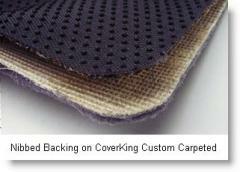 A water resistant layer is added to protect the vehicles carpeting. Premiere and Cover King back the mat with a heavy nibbed backing to prevent the mat from creeping into the accelerator or brake pedals, while theIntro-Tech Designer Auto Mat uses a new backing called "open cell foam" to prevent slippage. Finally most manufacturers sew a color coordinated edging on to finish the mat, with Nifty adding a molded vinyl outer edge to prevent water and dirt from escaping the clutches of their Catch-All Mat. To enhance the appearance of your carpeted car mat you may take advantage of the custom embroidering, personal monogramming or logo designs offered by manufacturers like Premier . Tip: Keep your ccar mats looking and smelling good by using universal absorbent car mat protectors. They absorb liquid spills from soda pop, coffee, gas, oil and other grungy stuff. They reduce stains on your expensive mats and keep mold and mildew odors out of your vehicle.